Lately I have taken a liking to the little packs of frozen berries you can buy at the supermarket. Berry milkshakes, Berry and white chocolate muffins, and my most favourite... Berry Crumble. 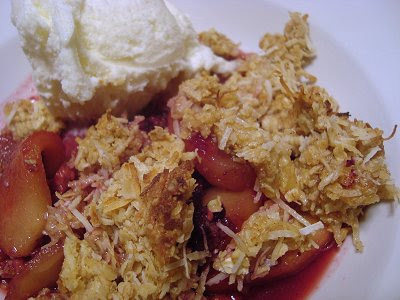 Crumbles are so versatile and easy to make... and you can practically stick any fruit in a crumble (well, maybe not grapefruit) and create so many variations for the topping... fresh, tinned or frozen fruit. And the great thing about crumble is that it fills up hungry bellies, the most hungriest at the moment in our house being Master 10's (he actually eats more food than his Dad!). Please 2 cups of stewed fruit (i.e. apples, berries, feijoas, pears, apricots - you can get as creative as you want!) into the bottom of an oven proof dish. 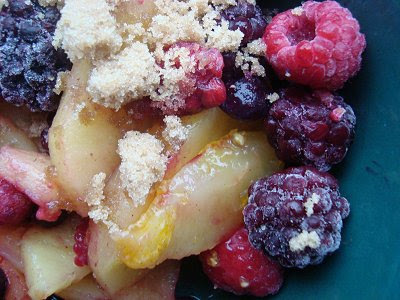 Sprinkle the fruit with 2 tablespoons of brown sugar. Sift ½ cup flour with 1 teaspoon baking powder into a bowl. Cut in 50g butter (sometimes I just melt the butter a bit and stir it in instead) until it resembles coarse breadcrumbs. Stir in ¼ cups sugar and ½ cup of rolled oats. I often add about ½ cup shredded coconut and half a teaspoon of cinnamon too. Spoon the mixture over fruit and bake for 30 minutes or until pale golden. Serve with ice cream, custard, yogurt, cream or milk. oh my, that looks so good!!!! This is my kind of dessert! I love everything with fruit -- but we've yet to try this. Thanks for such a great recipe.